Caryn Hartglass: Hello everybody. Hi, how are you all doing today? I’m Caryn Hartglass, and it’s time for It’s All About Food. It is all about food, you know that, and I know that. So, I’m really enjoying the day today. It’s nice, and fresh, and cool, and wet. The seasons are really fun. I had actually closed the window because the air is so cold and I put some cozy socks on. This is quite a change from the summer, and it’s just really nice to feel the change, and we are going to be talking in a moment with someone who might have some enlightening things to say about the change in seasons when it comes to foods, and perhaps I’m planning to bring on my guest Steve Brill. He has been on the show [1.21] years ago. He is a naturalist author. 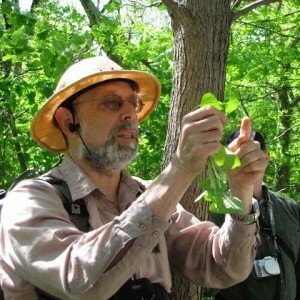 We call him wild man Steve Brill and he is a leading foraging tours in parks through out the greater New York area since 1982 for the public, for schools, libraries, parks departments, day camps, scouting groups, teaching, farms, museums environmental organizations and more. And we are going to hear a whole lot more in a moment. Steve, are you with us? Steve Brill: Yes, and my daughter and partner Violet is here too. Caryn Hartglass: Fantastic. Hi Violet, how are you? Caryn Hartglass: Good. And I understand that Violet is a 13-year-old naturalist, a self-taught expert on birds, and she’s been co-leading half of your public tours, and many private tours with schools, scouts, doctors, museums, day camps, teaching farms, birthday parties, herbalists, artists, since she’s been 9-years-old. Fantastic. 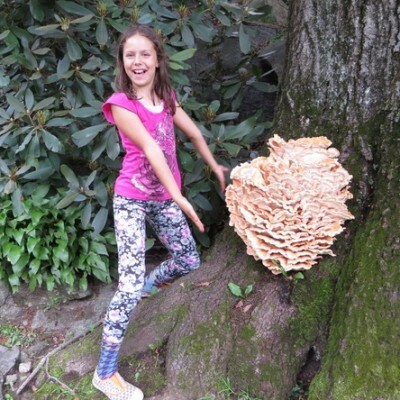 We are going to be talking about edible, medicinal, wild plants and mushrooms plus hands-on environmental education for kids today, right? Steve Brill: Let’s not wait. Caryn Hartglass: Excellent. Now, I’m hearing a little bit of moving around. So, if you can stay still and talk, we won’t have some of that clunky background noise. Got it? Steve Brill: Yeah, well that noise isn’t coming from us. Caryn Hartglass: Oh, is it coming from me? Maybe it is coming from cyber space. Violet Brill: Right now, I mean, we are just sitting still right now. Steve Brill: Now I said something in the background. Violet Brill: Yeah, I hear like a shh shh shh sound, like a whispering sound. Steve Brill: What bird species would that be? What bird makes that sound? Caryn Hartglass: [Laughter]. Anyway, so, how are you guys? Doing good today? You are good? Steve Brill: Yeah we are great. Caryn Hartglass: It’s not the best day for foraging in New York. It’s kind of wet and rainy. Steve Brill: Yeah we are happy to be here. We are so excited. We didn’t even stop for a big bunch of ringless honey mushrooms that Violet spotted from the car, not the first time. Violet Brill: We were driving down the road here, and I just saw them. Caryn Hartglass: Wow! What did they look like? Steve Brill: They are brown, they grow in clusters near the bases of trees. They are deadly if you are a tree. That will parasitize you and then grow through your roots to the next tree and kill that too. They are like a mass murderer for trees, very dangerous. For people, they are normally considered just good. Edible mushrooms have three classifications: choice, good, and edible, and these are only good, but I recently discovered that if you roast them with a puree of white miso, olive oil, pine nuts, and spices, garlic, rosemary, sage, thyme, and a little bit of hot sauce, until they start to brown in the oven, they are really really good. Caryn Hartglass: Really really good, not just edible, but really really good. Steve Brill: Yeah, they become choice. There are things you can do with mushrooms that are considered mediocre that become great when you cook them the right way. And the most, best known example of this is that mushrooms that are bad, sautéed French method are actually excellent in soups which is how some of these mushrooms are cooked in Chinese and Japanese or Korean cuisine. They know that these are not ones that you sauté or stir fry and the ratings and the western mushroom books are therefore just wrong. Caryn Hartglass: Well, my understanding is from the medicinal point of view, it really helps to boil the mushrooms for really long time. Steve Brill: It depends on how you want to use them. Violet Brill: And it also depends on the species of the mushrooms. I mean boiling mushrooms, means sometimes it wont give like much flavor. Steve Brill: Often the medicinal substances are water-soluble. With plants it depend on the plants. Some plants the medicinal principles are alcohol side. When you make a tincture, you soak them in alcohol, and then remove the plant and pour a tablespoon of alcohol into a cup of water just off the boil, leave that uncovered for 20 minutes so the alcohol evaporates and then the tea is ready to go. Caryn Hartglass: Well, that’s really interesting, because I remember looking to see how to do a tincture, to draw out the alcohol soluble components of mushrooms rather than the water soluble parts, and I never saw anything that sounded that simple. Steve Brill: It depends, like sassafras you boil, and harmony evening primrose flowers you tincture. Steve Brill: Well you tincture first. Steve Brill: And then put the tincture into the water instead of hot water and boil the alcohol. Caryn Hartglass: Let’s delve some more in to medicinal wild plants. What have you got tourists? How can you help us? Caryn Hartglass: Give me some examples. Steve Brill: Ok we have purslane in the refrigerator. That is an extremely good source of iron and vitamin A, probably-I’m a vegan- probably the best vegan source of omega 3 fatty acids, which prevents heart disease. And I am thinking of making a soup with that, some quinoa and rockweed, which is seaweed, which we have in the refrigerator. Caryn Hartglass: I have a question about purslane because when I used to get it in my community supported agricultural box, I didn’t care for it very much. It had a funny texture, kind of slimy. So is it better when you cook it in a soup? Steve Brill: Well, it depends if you are the type of person who hates okra, you may not like purslane. Steve Brill: If you don’t like it, it’s called slimy, if you like it, it’s called mucilaginous. So you have something that’s thickened like, something thicken with sassafras leaves in gumbo, and I love the stuff. Caryn Hartglass: Okay, is there another word other than mucilaginous? That doesn’t sound too good either. Steve Brill: Those are the two words that are generally used. Caryn Hartglass: I’ll try it again sometime, because it’s so good for you. Steve Brill: Yeah, and I love it. I have made dozens of recipes with it. Caryn Hartglass: Oh, that’s cool. I heard that that’s really good for you. Burdock jerky. Violet Brill: Yeah, we marinated and then we baked it, and it came out really well. It’s like textured jerky and with like the same herbs and spices. But it’s burdock. Steve Brill: And then it is, I do have to admit it, it is a political plant. And you have to, you have to know that. And it has a really really deep root. It’s hard to dig up, and what you want to do is go with a shovel, hold the shovel– go after it rained when the ground is soft, hold the shovel really tight in two hands an inch from the root, and then stomp as hard as you can on the shovel yelling “Donald Trump, Donald Trump”, and the burdock comes right up. That’s the environmentalist method of digging up burdock. Caryn Hartglass: I didn’t inform you beforehand, but I don’t like hearing that person’s name on this program. [Laughter]. That’s okay. In certain instances. All right. So, burdock is good. Now, we don’t know what some of these things are because this is an audio show and some people may not be familiar with them. Now, I know that you give tours in the New York metro area. The first question I have for you is it– is it legal yet to forage in city parks? Steve Brill: Well, technically, it is legal. There is a park regulation that says thou shall not remove any vegetation from the park, which includes kinder garden kids removing autumn leaves from the park. But that is a regulation; it’s not a law. A law is something that a legislature passes. So, technically it is not illegal. It is against park regulations. So, back at 4 p.m. on March 29 1986, I was leading a foraging tour in Central Park and it turned out that there were under cover agents on the tour. A man and a woman, they said they were married; they never held hands or kissed. I figured that they have been married a long time. They paid me with marked bills; they had surveillance cameras and walky-talkies. Every time I held up a specimen, the man would take a picture, only I was the specimen. And at the end of the tour, I ate one leaf of a dandelion, the male ranger ducked behind a tree to have his walkie-talkie “All right, there he is on on 86th street, go get him. Every park ranger in Central park popped out from behind the bushes. They surrounded me in case I was going to climb up the tree. They put me in handcuffs lest I bop them on their head with a dandelion. They searched me. I don’t know if they were looking for weeds or weed. And then they hauled me of to the police station in handcuffs. They took fingerprints, they took mug shots, they searched my backpack, fortunately I had eaten all the evidence. And they issued me a desk appearance ticket that said that I had to go to court and can face up to a year in jail if convicted. The charge was criminal mischief for removing vegetation from the park. This was before the Internet. So, after 3 hours in jail, they let me go with the desk appearance summons. And I went and told every TV station, newspaper, radio station, wire service in the phone book. Next day, on the way to the newsstand, 5 cops came after me. “What do you want?” I said, ” I haven’t eaten a single dandelion, I haven’t eaten any breakfast yet.” One of the cops said, “We don’t care, we want your autograph.” I was on front pages of newspapers around the country, 5 minutes on CBS evening news with Dan Rather, Channel 2 and Channel 4 news, waiting behind them online. I got on everything from Letterman to MTV, the BBC covered it in London: “and in New York city they arrested a man in Central Park for eating a dandelion.” When they took me to court, I served Wildman’s Five Borough Salad in the steps of Manhattan criminal court house to the reporters and passersby. I love cooking, and this recipe was great, the press ate it up. I got on all the TV stations and newspaper a second time. TV shows, I couldn’t walk down the street without people stopping me to shake my hands. And the PR forced the Parks Department to turn over a new leaf. They negotiated with me to drop the charges and hired me to lead the same foraging tours I was leading when I was arrested. And when the parks commissioner and I shook hands, we got on all the media a third time. I worked for the Parks Department from ‘86 to ‘90, and left when new administration came and basically reneged on the agreement with the old one. Ten years later, a previous commissioner, Benepe, basically told me that the real reason they had arrested me is because the park officials were terrified of frivolous lawsuits in their imagination someone would pretend to have been poisoned while foraging, sue the city who allowed foraging by pointing to me. So when they arrested for one reason, and the real reason was something totally different. It’s case of official wrong doing called false arrest. I wish they would do it again. Caryn Hartglass: [Laughter]. I wish they would do it again too. Now Steve, that was 35 years ago when you first started. Has anything changed in the parks that you have been foraging in, or there are still the same plants? Are there new ones? Have you lost any? Violet Brill: All things that we have been picking are just like we have been taking them every single time; we are picking them from the same spots, the same amount of them and the same spot for years. Steve Brill: Yeah, these are renewable resources. Violet Brill: They are not rare plants. Violet Brill: We pick them and then they grow back again and then we pick them and they grow back and we pick them again and they’ll grow in another spot. Steve Brill: There have been changes. Violet and I found wild carrots. In January, we make carrot bread with it. And normally carrots are around all winter but they are underground, and the weeds die at the end of November, and then regrow at the start of March. And we found the leaves right there in the ground so we could dig up the carrot in February. So there are two possible explanations. One is if we had really warm, wimpy winter caused by climate change, then the seeds were never obliterated, like something that you get in Virginia, not in the northern suburbs of New York where we live. But that would mean the global warming is true, and as everyone knows, that’s a myth. So, other explanation is people came and planted the carrots to tease us into thinking that global warming was real. Caryn Hartglass: [Laughter] I was going to ask you about global warming and there it is, youve enlightened us. Thank you for that. Steve Brill: I am a life-long student of science and if you look at the coral reefs, if you look at the evidence in the snow in Antarctica, all the climate models, fossils. Every single bit of evidence, which is published in peer review. It’s valued as convincing that climate change caused by humans is real as the earth goes around the sun because people denied that too for a long time. Caryn Hartglass: Yeah there is a whole flat earth movement going on. What’s next! Steve Brill: Who knows! A whole lot of bad ideas are going to keep repeating. We need better education. Caryn Hartglass: Yeah. Well, Violet sounds like she’s pretty smart and pretty well educated. Violet Brill: Yeah I learned all about the plants, the birds, the mushrooms; not at school. Steve Brill: Or if someone has a birthday, this is what we will do. Violet Brill: We have art; he has art that he made out of the plants. We do games, stories about the plants. Steve Brill: And we give out prizes. Violet Brill: Yeah, sure. We do that too, we give out samples of our recipes, like the burdock jerky. Steve Brill: Yeah. And you don’t need the standard educational system for learning and, again Violet learned all the birds on her own. She goes on to bird tours with adult birders who have been studying birds for decades, and this is as much as any of the grownups and that’s been going on for over a year. Violet Brill: Three years! I have a parakeet, his name is Wisteria. He is really smart. He is named after edible flower. Caryn Hartglass: That’s lovely. Violet, are there any vegetables that you don’t like? Violet Brill: That I don’t like? Violet Brill: I’m not sure. Maybe– maybe– Vegetables that I don’t like? There are some plants that I don’t really like to eat. Steve Brill: I can’t think of any. Steve Brill: You don’t like celery. Violet Brill: I don’t like celery! Violet Brill: I don’t like celery. I like it sometimes. I don’t like it if someone chops up celery and puts in a soup or something. I don’t like that. Steve Brill: These plants are very very flavorful. Violet Brill: There’s a plant called wood sorrel and it tastes like lemonade. It looks like clover except that clover has oval-shaped leaves and wood sorrel has heart-shaped leaves. Caryn Hartglass: What is it called? Violet Brill: Wood sorrel. W-o-o-d s-o-r-r-el. It means ‘sour’ in French and it taste sour like lemonade. Steve Brill: Violet says people confuse it with clover and they both have 3 leaves and the way I keep it straight is the wood sorrel has heart-shaped leaves, so it remains of me of violet. The clover has oval leaves, no hearts, so it reminds of my ex-girlfriend who ran of with another guy on Valentine’s Day 22 years ago who also had no heart. It’s only been 22 years. Caryn Hartglass: Oh! I know, I know. If we go in to a park and we forage, even though it’s not really okay because of the regulations, are there any other things we need to look out for? Clearly we need to know what we are picking, but are there any parks that use herbicides and pesticides, other things that might get on some of these wild plants? Steve Brill: Well, you don’t want to pick things in the gardens where they are spraying. If you see by some of the weeds that insects and bees are flying around, then you know there aren’t any pesticides applied. Violet Brill: But normally you want to pick away from the traffic, especially root vegetables. There’s this thing called field garlic and it looks and taste like a chive. You use the bulb of it also as well as the leaf. It’s like grass, except that grass has flat leaves and field garlic has round shaped leaves. Steve Brill: And the field garlic smells like onions and garlic, the grass for some reason smells just like grass. Caryn Hartglass: Well, that’s a funny thing. Steve Brill: That will pick up lead from car exhaust from when there used to be lead in the gasoline. So that one especially you pick far from the road. That was a difficult one for me to learn. I had no one to teach me. So when I started I had a field guide that showed the field garlic, but when I went out dozens of times and just never saw it. I’m into exercise and I just did a mile in the pool today, I did a mile on pool back 36 years ago, I finished swimming, and there was this guy by name of Chuck holding on to the side of the pool and I speak to him every once in a while. He said “Hey Steve, how are you doing?” I said “Fine. Chuck, you know I am into cooking. I am trying to learn edible plants now.” And Chuck says, “Steve, I know one. It’s called field garlic.” “Field garlic! Chuck, where is it? You have to let me know.” I almost drowned the guy. He finally admitted that it grew near a ballpark in Alley Pond Park in Queens by the back stop. I just showed Violet 2 weeks ago she heard this story all of her life, we actually went there for the first time, and next day was my bicycle exercise day. So I bicycled out there and there was the field garlic right where Chuck had said. I smelled it, definitely in the onion and garlic family, picked the lot of it, started bicycling home, and then I started seeing in other spots in the park. Violet Brill: Once you know these plants, you can recognize them one time, you can recognize them every single time. Once you go on our tours, you’ll keep recognizing the things like in your yards, and when you walk down the streets you will recognize them. Steve Brill: Yeah, when I got home, there it was growing right in front of the service entrance to my apartment the way I entered with the bike. I have been confusing it with a grass. And as Violet said, grass has flat leaves, field garlic has round cylindrical leaves. And there are a lot of vary obvious things that you are going to learn when you are a beginner, one thing is you smell everything. Another danger is poison ivy. So that one, you have to learn what it looks like in all its stages. So we show people all the stages there in front of us. I have my app and we look at pictures of different times of the year and different parts of the plant. You want to talk about poison ivy? Violet Brill: Yeah. So poison ivy has three leaves. The middle leaf has a stem. And if you touch it, you’ll get a rash. It has lots of different stages. It’s a woody plant that can grow like a vine on a tree, on ground just like a shrub, it’s a great stick coming out of the ground with little buds. If you touch you can get a rash. Not everyone gets it. And if you do get the poison ivy it will stay there for about a week and it is very annoying. But the two good qualities is that one it is easy to find, it can grow in wet areas, dry areas. And the second great quality about of poison ivy is that it is reliable. You can count on it. Sometimes you have a friend and they say something to you, but then they just don’t do it. They are not very reliable or someone you can count on. With poison ivy it will give you a rash at any stage no matter what! That poison ivy will be there for you. Steve Brill: And as Violet said, not everyone is sensitive to it. There was an old German lady by the name of Luisa who came on one of my tours and started pumping my hand. “Hi my name is Luisa, so happy to meet you, I read about you in the newspaper, you’ll show me a lot of plants. Ya?” So I said we are going to start the tour, looking for poison ivy. And Luisa enthusiastically grabs it in her hand shaking it around, “it’s poison ivy, it’s just a plant.” “Luisa don’t touch it.” “Nein, I touch it all my whole life”. A week later Lisa comes out on another tour. Both her arms are covered with bandages. “What happened to you?” “You were right, I shouldn’t have touched that poison ivy. I won’t do that no more.” It took her 60 years to become sensitive to. Caryn Hartglass: Wow! That’s a good story. Steve Brill: There is one person who wouldn’t be harmed, a very famous person, lives in my region in Westchester. And his wife is even more famous than he is. They live in Chappaqua, and that is Bill Clinton because he doesn’t inhale. Caryn Hartglass: You guys are a riot. I was going to say you should be stand up comedians. But I guess you are. You stand up in the park and do your thing. Steve Brill: Oh yeah! we have a lot of fun on the tours. And people who want to find out about us, it’s wildmanstevebrill.com. The app is “wild edible forage”. I have five books all with different emphasis, cookbooks, Foraging with Kids, Early Spring Shoots and Greens, Wild Vegan Cookbook, a whole bunch of different books, and Violet will do this when she grows up. Caryn Hartglass: Wow! I have one question. Are you familiar with the art project Swale? Steve Brill: Yes, I may wind up working with them. I have been in touch with them. We are looking for a date. That will be a lot of fun, I can’t wait for us to do that. Violet, it’s a barge that’s in the Hudson River that has edible wild plants in it. Violet Brill: I have heard about it. The website is swaleny.org and my understanding is because foraging isn’t really encouraged in the parks, this artist created an edible forest or an edible garden on a barge which isn’t on land, so the regulations don’t necessarily apply. And children and adults can learn all about all these plants and it’s a fun thing to do. Right now it’s in the Bronx. Steve Brill: I think they, in some mid September they are coming to Manhattan, and I am going to probably do a tour with them in the morning and on a day when I have central park scheduled then do central park in the late afternoon. And again, people can come on my tours. No one has come after me in 31 years and again the main concern as related to me by commissioner Benepe; is that they have their legal butts covered by saying that they don’t allow foraging. So they are not afraid they are going to get sued. I get it. It’s all about lawsuits and liabilities when it comes to food. Wildman Steve Brill and Violet Brill, thank you so much for taking time out of your day to join me and on It’s All About Food. It’s really been a lot of fun. Steve Brill: It’s been a pleasure. Ok last thing we have to say is, [drumming]. Steve and Violet: So that’s all folks. Caryn Hartglass: [Laughter] You guys are great. I wish I knew it. I am going to harmonize with you. Thanks again for joining me. Caryn Hartglass: Your welcome. That was Steve Brill and Violet Brill, and check them out at wildmanstevebrill.com. Let us take a little break, and when we come back, I am going to be talking with Celine Ikeler. We’ll be right back.